Vincent and Catherine are married, but dumb tourists are still getting into car accidents. To make it even worse the Blogosphere (!) knows about Beasts. But not for long, since bloggers never learned how to use VPNs. Meanwhile, Tess just wants to be a regular cop and Heather finds a creative way to get a date. Meanwhile, JT is back to teaching and enjoying the beast-free life until… one of his students asks if “cross-species DNA” is a suitable thesis topic. JT is all “hell no… you should see what happened to Dr.Marks after he decided dig into this area” But the student is not easily dissuaded, especially since he believes cross-species creatures are no longer theoretical. He believes that because he read it somewhere on the blogosphere. Not the BLOGOSPHERE! In case you weren’t paying attention, the blogosphere is the new BIG BAD… OK, maybe not but they sure were making it sound like it. JT tells Tess about the looming threat of the Blogosphere, but she doesn’t think a bunch of geeks typing away on blogger are a real threat. So JT decides to find another partner in crime: Heather. JT and baby Chandler quickly track down a particular blogger - PETER DUNCAN - who seems to know a little too much about Beasts [but not a whole lot about masking his IP address]. Heather is no stranger to breaking the law - she just got a ticket for jaywalking after all - so she suggests that breaking and entering to Peter’s apartment is the way to go. Unfortunately, when JT and Heather get there they realize that Blogger Peter is a little deader than intended. Not just that, his killer - who seems to be a Jason Statham wannabe with a Rambo complex - is there and he doesn’t seem too keen on witnesses. By some miracle, JT and Heather manage to escape through the window, but Heather misses the fire-escape and falls three stories. Heather is transported to the hospital by a cute paramedic - KYLE - while JT calls Cat and Vincent to tell them the bad news. Vincent and Cat fly back to NY immediately. Tess is not thrilled about interrupting their honeymoon and she is pissed that JT keeps looking for beast trouble, but has to admit that something is going on. This feeling is confirmed when the DHS Agent handling the beast cases [yes I can’t be bothered to remember his name, what’s the point?] is found dead [see? No need to learn his name now]. The Beast Hunter [I guess we can call him that?] didn’t get the info on Vincent from the DHS computer, but he did find a file on Cat. Naturally, she offers to be used as bait. Unfortunately, their plan misfires because Vincent is rusty at beasting or something like that. So the Beast Hunter abducts Cat and takes her to his… DEN? As he gets ready to torture her for information about the last Beast, he conveniently explains his deal. Basically, his is just a man trying to make a dishonest living as a bounty hunter. And I say “hunter” in the most literal sense. He “hunts” whatever they pay him to hunt: Animals, humans, cross-species creatures [vampires, aliens… probably too] And apparently the going rate for a beast is 5 million dollars! 1) I would totally pay 5M bucks for Vincent, worth every penny. 2) Who could have 5M dollars to spare for the last beast? Maybe Mr. Beast Sicario could have told us… but before he starts sharing his plans for early retirement Vincent arrives to the den and kills him. Let’s take a minute to appreciate that Cat didn’t give a SANCTIMONIOUS SPEECH and Vincent didn’t spent half an hour feeling guilty for beast killing a man. JT and Tess also have a talk. JT confesses that he hasn’t lived a normal life since his KIA best friend showed up at his door over a decade ago. So… he has the need to be a part of something bigger. And no, teaching undergrads doesn’t count. Tess agrees to support him in his quest, but she doesn’t seem to too thrilled about it. She just wants to worry about drug dealers and murderers like the other lucky cops. I didn’t dislike this episode, but I was underwhelmed by it. Nothing “stayed” with me after watching, unfortunately. But if I examine it by parts, I’d say it was better than most. .It had a clear narrative [if not very original], the dialogue was funny and they had a few cute scenes. However, there is a lingering issue with BATB. For a while now, BATB has been a show about ‘beasts’ and that is clearly not going to change this season. Trouble is, when it was first conceived, BatB was NOT a show about beasts. It was a show about a relationship between a woman and a man, who happened to be a beast. That is no longer the case. The show was retooled, the focus shifted and the relationship was resolved [I mean… they are married]. That doesn’t make everything about it bad, but it is a different show than the one we started watching four years ago. I am not expecting them to go back to the core, I don’t think they can [or know they should....] So here is what I ask from Season 4… Be a fun season to watch, get a good villain, have interesting action a decent mystery [not too optimistic about this], stay true to the characters and don’t force conflict. 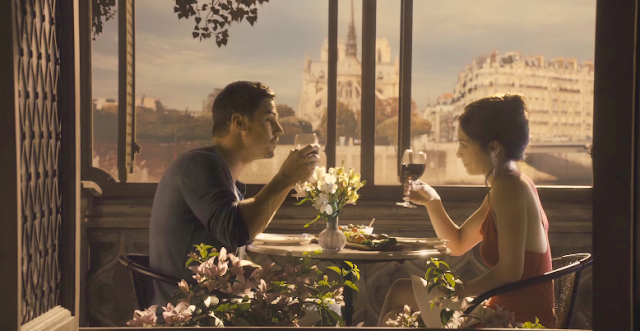 A few years from now I will probably remember the good moments of BatB rather than the bad… that is if they don’t completely screw up the ending! Monsieur and Madame Bete is a lame episode name. I didn’t even like it when Kurt Sutter did the whole French thing on SOA, but at least it sounded kind of badass. I hope Heather’s new boyfriend sticks around [according to IMDB he will]. Her relationships keep ending abruptly. Plus everyone knows V’s secret so it would be nice to have a clueless person around. great review as always! I was laughing hard reading your synopsis. you know my thoughts about the episode, they are not dissimilar to yours, but I am bitter. but yes, let it be a semi-decent season (cause it aint gonna be a great one) and let us enjoy as much as we can. so glad you are reviewing it again! Underwhelmed ~ that's the word thank you Ale! Was my least favorite season premiere and I'm gutted that I feel this disconnected from BatB at this time when I want to cherish every precious VinCat moment. "When it was first conceived, BatB was NOT a show about beasts. It was a show about a relationship between a woman and a man, who happened to be a beast. That is no longer the case." I guess I should unclench my teeth now and say RIP to that WOW factor *le sigh* Shame on TPTP for losing that emotional core of BaTB that has kept me fighting for this show every day for the last 3 years. </3 BUT I don't want to lose faith. Surely there will be more meaningful episodes coming up to keep this season from spiralling even deeper into sitcom hell for VinCat ~ and this from someone who loves funny ~ when it's done right ~ like Chuck! As always I live in hope even if it is wishful thinking because I only want to take away from BatB the good moments ~ however few there are left ~ que sera sera! Loved reading your review, as always. I agree with all your points except that I think the writing was mediocre (well, I'm not an expert, but gosh I was bore! ), and that I think there's this very present shift from VinCat to JTnT as the serious couple. This episode was all about rehashing the old recycled lines & plots! Gosh! I have become allergic to "normal, getting exposed, move on/forward". I mean, they've taken repetition to a whole new level. Yes! I'm still bitter. Sigh! The thing is, even the funny scenes weren't VinCat-y. It's another form of comedy which is so not right for VinCat. Oh well! What's done is done. Just two more points: I really wish they had kept Sarah around - loved her & JT together; and I loved Heather as usual - just wish they had kept the comedy part confined to JT & Heather and not try to make another FRIENDS out of our Scooby Gang. Pretty much agree with everything, except that I wasn't as underwhelmed as you... however I realised that meant that I wasn't really expecting any more than it was. That's not a bad thing.. or maybe it is, haha! But I am concerned that we'll fall back into the trap we did last year of endless repetition of the same thing over and over...this ep it was Cat turning every condo with V (even on their honeymoon) to worrying about exposure and losing their normal life. Agghhhhh! Oh and if V lost Cat because "I haven't done this in a while", I guess they forgot that 10min earlier in the ep, JT said "Vincent Beast-tracked the killer from the blogger's apartment". I love Heather too hehe but I would like her to get an actual storyline rather than just being cute comic relief all season. And she has the potential for the most interesting interactions with her new clueless boyfriend. So I am hoping at least they do that right. And yeah, I wasn't really expecting a whole lot. I enjoyed the episode well enough, I didn't dislike it, it didn't piss me off but after I watched it I kind of forgot about it. So I guess that's what I meant by "underwhelming", it didn't leave a mark... because it was a lot of the same "we love each other, let's worry, no let's not worry, beasts, threats, blah blah"
That should say "convo" with V, not condo!